The Big Island … is the youngest and largest of the Hawaiian Islands, and thanks to Kilauea’s constant eruption over the last 20 years, it’s still growing! The Big Island is almost twice as large as all other Hawaiian islands combined. While it is the biggest, it isn’t the most populated … there are about 186,700 residents. (Honolulu is NOT located here … it’s on Oahu.) The Big Island is made up of five connected volcanoes, two of which are extinct, one is dormant, and two are very active – Mauna Loa and Kilauea. Two mountains define the landscape of the Big Island. Mauna Kea and Mauna Loa are over 13,700 feet tall, and their summits often get snow during winter months! Because the island is so young, there are miles and miles of lava flows that are less than 200 years old. There are fewer beaches here, but the few that have formed are incredibly beautiful. 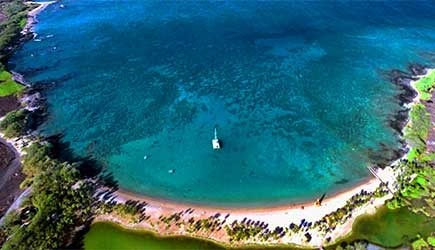 The Big Island offers the best scuba diving and snorkeling in the Hawaiian islands. Most resorts are on the Kona side of the island, with the most exclusive resorts being found at Waikoloa and Kohala to the north. 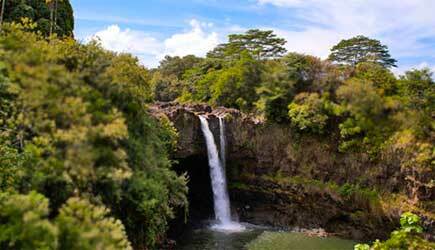 Hilo has a few hotels, but is the more “local” side of the island. Kona and Hilo both have major airports. The Big Island is 95 miles tall and 80 miles wide. Drive time from Kona to Hilo takes about 3 hours. 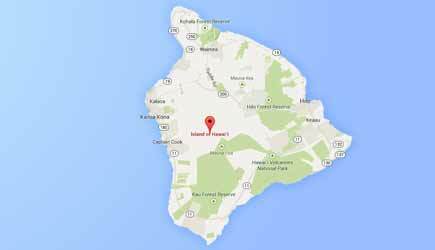 Major airports are in Kailua-Kona (KOA) and Hilo (ITO) … Kona is where most tourists stay, but Hilo is the county seat. It is the by far the largest island in the Hawaiian chain. Honolulu isn’t on the Big Island … it’s on Oahu. 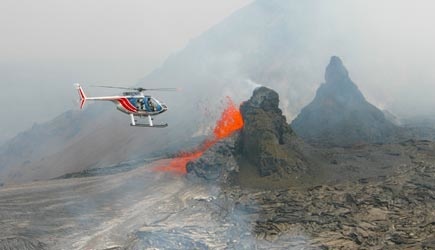 Kilauea Volcano is the world’s most active volcano and has been erupting constantly since 1983. Measured from it’s base on the ocean floor, Mauna Kea is the largest land mass on the planet, rising over 33,000 feet tall and dwarfing Mount Everest in sheer volume. 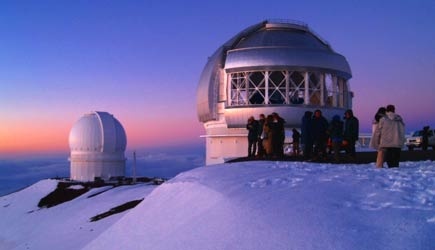 The summits of Mauna Loa and Mauna Kea are almost 14,000 feet above sea level and often receive snow in the wintertime. 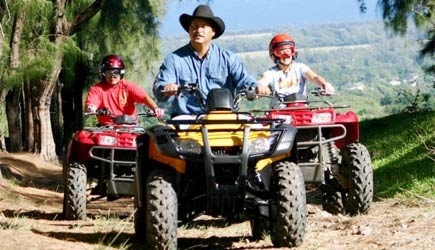 The Big Island is made up of 5 volcanos that overlap into one giant island. A new island called Lo’ihi is forming off the southeat coast and is expected to break the ocean’s surface in 10,000 years or so. South Point is the southernmost spot in the United States. © 2000-2015 by Adventureinhawaii.com / HawaiiTravelandTours.com LLC Any use of images or text from this website requires written permission.